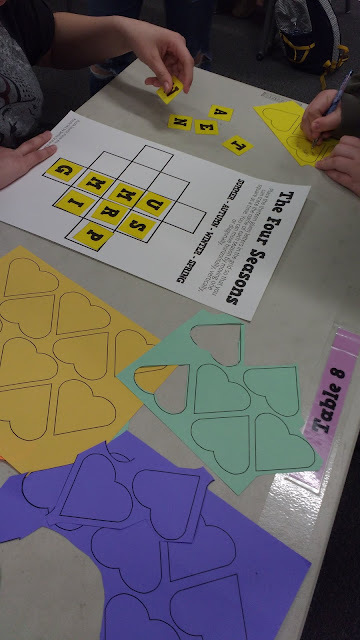 It only seems appropriate to share this great big valentine full of math puzzles on February 14. 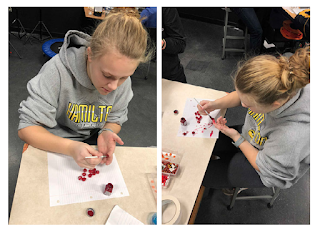 Sarah Carter is a high school math and science teacher in Drumright, OK and her Math = Love blog is full of great resources. Sarah recently created a page with links to all of the puzzles she's shared across various posts going back to 2011. Although many are geared for high school students, some may work for elementary or middle school and adaptions can be made to the basic ideas shared. "Hook" by Blues Traveler is just one of those songs that makes me feel good any time I hear it. I was listening to it around 5:30 this morning as my brain was slowly morphing from dreamland to its educational focus. Although this song was written more than 25 years ago about music, what hit me today was how it applies to what we do in the classroom. The line "Because the hook brings you back" is exactly how teachers are crafting experience to build long term student engagement. Dave Burgess has done tremendous work transforming the way educators practice their craft with his Teach Like a Pirate (TLAP) approach. One of key parts of the analogy (I almost wrote metaphor but it uses "like".) is the "hook". Get it? Pirates, hook? It's basically what John Popper is singing about in the song by the same name. 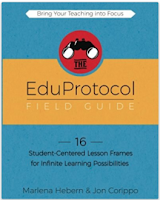 The hook is that irresistible little piece of the lesson that creates instant buy-in. 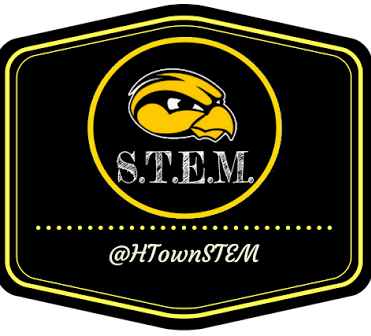 I have discovered several hooks that get our learners amped each week to come to STEM. Sending Legos down a zip line made of fishline is one of our most popular activities. Another is building Lego drones by Flybrix. 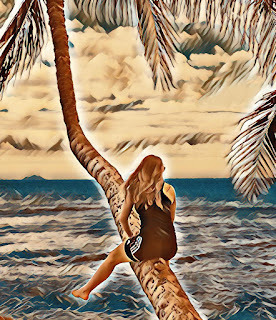 By hooking them with the unique experiences, I am able to pile on all of the learning like countless reps of going through the design process or analyzing elements of flight at work. 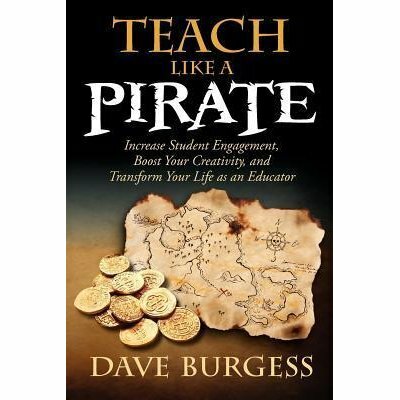 Bonnie Capes from South Brunswick Public Schools in New Jersey has a great blog based around leading her colleagues in a TLAP book study. Her "Crash Course in Hooks" post outlines in helpful details all of the different ways Burgess suggests teachers can their kids. Now, let's get back to the music. What I hadn't ever noticed in "Hook" was one stanza that deepens the song's connection to teaching even further (proper grammar aside). And it don't matter who you are. If I am doing my job, it's your resolve that breaks. Yep, that's our job...breaking the resolve of reluctant learners. Math teacher Dan Meyer is famous for describing what he does as "trying to sell a product to a market that doesn't want it but is forced by law to buy it." Check out his Ted Talk and you will see how he's a master at breaking that resolve with a unique tool box of hooks. So, next time you hear Blues Traveler sing "Hook" think about true it rings in the classroom. Michigan district puts the skids on sneaker initiative. The following is a fictitious "what if?" account of what usually happens when educators are blinded by the notion that 1:1 solves everything. It was originally posted in September of 2013...and still rings true. What was initially hailed as a groundbreaking effort by the Rivermont Public School district (Mich.) to fight childhood obesity is now being re-examined and possibly moth-balled by school administrators over concerns of student mis-use. 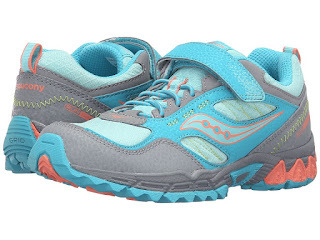 When students arrived at the district's three schools twenty-five minutes north of Grand Rapids this September, each was issued a new pair of Saucony running shoes in the nation's first ever 1:1 sneaker initiative. The district received a special mention on Good Morning America and a framed, hand-written letter of congratulations from First Lady Michelle Obama hangs in the foyer of each building. Less than a month into the new school year, the district has slammed on the brakes and each teacher is being asked to collect the athletic shoes and store them in a closet until further notice. The holdup you ask? Apparently the kids are having too much fun in them. "Our grand vision was that students would use the sneakers for a school-wide fitness program that is guided by a rigorous curriculum of lap running and agility training throughout the day," stated superintendent Eli Tanis. "Our teachers are coming to us and telling us that the kids have no interest in these activities and instead are using the shoes for their own personal activities." "Never before have we seen so much spontaneous running, noise, or such large groups of roaming mobs playing tag at recess. It can get terribly stressful," said first grade teacher Susan Vanderslice who has been at the same position for 31 years. "Before the shoes were just given to the children without any formal teacher training the playground was much calmer. Children simply milled around. It was very easy to maintain control." After talking with a few students whose families asked that their identity be concealed to avoid any problems with staff at school, most kids don't see what they are doing wrong. "They gave us these sweet shoes," says Fifth Grader (we'll call) Jake. "I couldn't wait to get on the court at recess and work on the cross-over dribble I have been perfecting this summer. Our teacher won't even let us wear the shoes outside though because he is afraid they will get dirty or something. He only lets us carry them to the track, put them on to run laps, take them off, and then carry them back inside. Running laps feels like doing penmanship." Jake's parents echo their son's sentiments. "It seems like they are really missing the forest for the trees. They seem so focused on limiting what the kids do in the shoes. Shouldn't they just encourage any activity and movement at all? Take the time to teach the kids new games and give them time to just enjoy being active, whether that is outside when the weather is nice or inside once winter comes. We think that should be the ultimate goal, building healthy habits." Rivermont curriculum director Shirley Wolverton defends the district's approach. "We have to insure growth. If we simply let the students play whatever they want in the shoes then there is no way to guarantee teachers will meet the benchmarks we have prescribed. If our lap numbers don't increase, our staff will have failed. The only way to increase a student's ability to run laps is to run more laps. " A meeting is scheduled for Monday night at the school's board room where a sub-committee has been formed to investigate what modifications might be made to the program. "We hope to have some answers quickly," Superintendent Tanis explains. 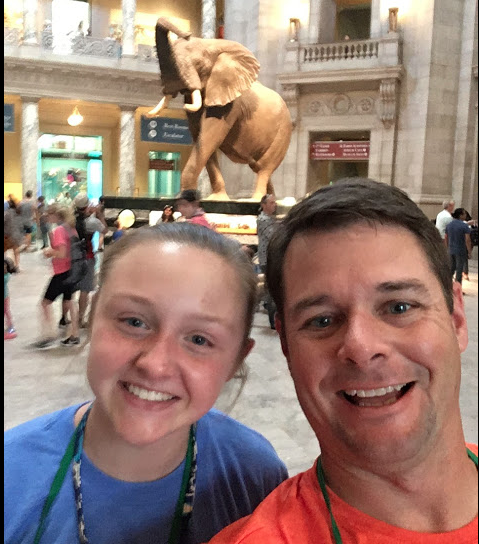 "My biggest fear is that we will wait too long and the students will have all outgrown the shoes by the time we return them. We are also missing valuable lap-time on the track. Students need to know though that there is a difference between serious school work and the taxpayers of this community aren't financing just play." Thankfully the above account is fictitious. There is no Rivermont, Michigan but unfortunately this kind of thinking is far too prevalent in education. This silly post was the mental fruit cultivated by my hearing that Los Angeles Unified School District is temporarily moth-balling its one billion dollar 1:1 iPad efforts because students have easily hacked the devices' security controls. Allowing kids to create content they are passionate about makes it all the more motivating for them to create a similar type of project on something being studied in the classroom. The same is true with giving every kid a pair of sneakers. Running laps isn't the only way to increase the ability to run laps. Someday I would love to attend the TCEA Conference in Austin. 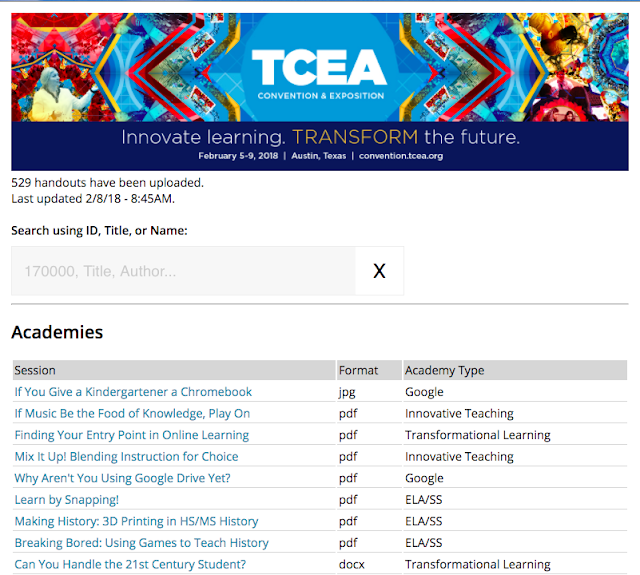 In the meantime I will be digging through the absolute gold mine of presenter resources that is freely available on the TCEA site. Thanks to Tony Vincent for sharing the link to these. At last count there were 529 different session resources posted. Tony's post today really opened my eyes to start making it a habit to go look for session resources from other great conferences held throughout the year. Our district reading specialists are doing a great job by creating individual profiles for all of our elementary students. Those are shared via Google Sheets with other staff so we can best tailor instruction to each child's needs. 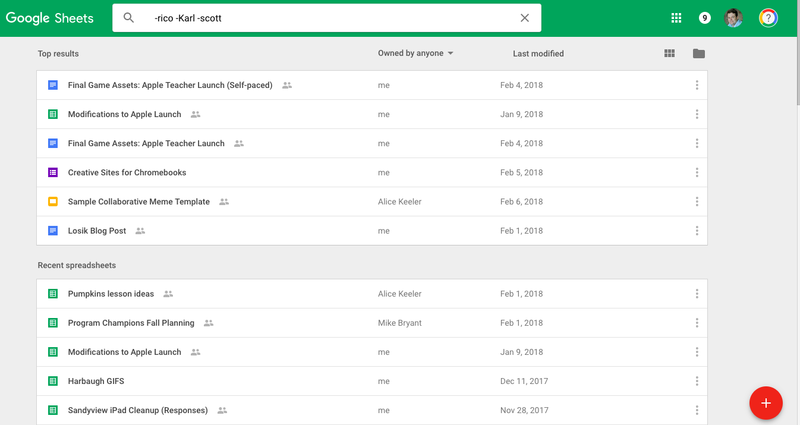 With that comes a lot of clutter to Google Sheets in the "Shared with Me" section. Add in the fact that I am at four schools and it can get really messy. I just discovered this trick though. In the search bar simply type "-" and the person's name sharing the multiple files. Everything they have shared with you disappears from the list. You can even type several names if you are trying to de-clutter even more. I love that information is being shared to tailor education, sometimes I just need it out of the way in order to find the sheet I am currently needing. The best part is that nothing is actually deleted, just hidden temporarily. By subtracting certain owners, their shared documents are temporarily hidden. A lot of adults say, "You couldn't pay me to be a high school student in this day and age." Sure, I get the sentiment with the way social media has made the minefield of teen social interaction even trickier to navigate. I think I would still go back...temporarily...just to take "Covering Hawkeye Sports" from Mark Behnke at Hamilton High School in Hamilton, Michigan where I teach. 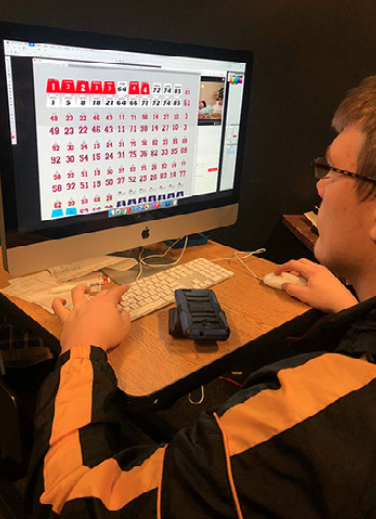 Covering Hawkeye Sports has not only won 11 Michigan Interscholastic Press Association state championships but it is really an example of technology being integrated into learning at its best. Mr. Behnke's journalism class is essentially a college-level sports information department covering a mid-sized high school. They live stream games with commentary. They live tweet games and host social media nights just like major colleges and professional teams do...and these are 9th to 12th graders. One of the coolest things these kids do is recreate game highlights in Lego stop-motion. 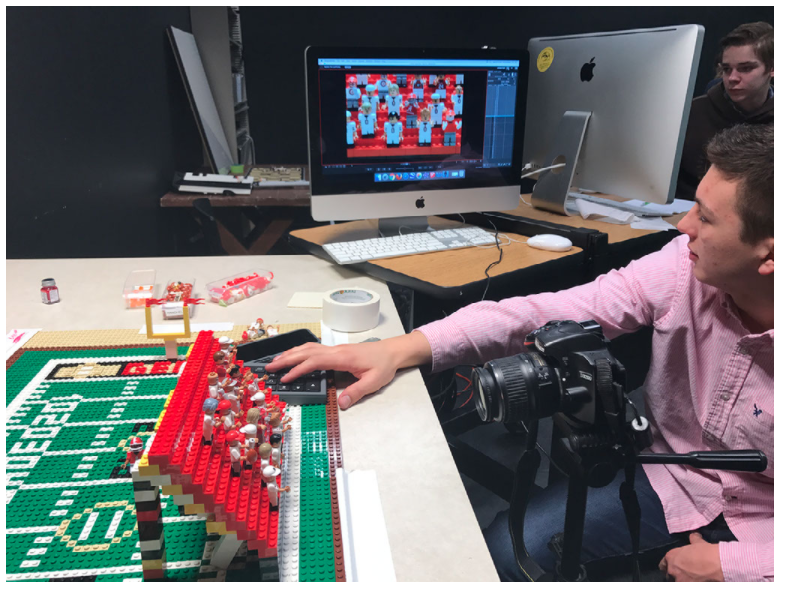 This is a process where a film starring Lego characters is shot frame by frame and characters are repositioned after each frame to create the illusion of fluid movement. One second of footage can involve as many as 15 of these cycles. Students have gotten so good at it that they even hosted a camp for elementary kids this past summer to share their craft. Oh yeah, they've also been asked by Oyo Sports to make highlight films of Super Bowl 51 and this year's college football national championship game. Oyo Sports is a major player in the Lego world by creating minifigures of major sports stars and teams. Oyo debuted CHS's Super Bowl video during last year's NFL Draft on its Instagram page. At its heart the class is all about story telling and a stop motion video is the same way. The "Fours C's" are everywhere when you look at activities like these: collaboration, communication, creativity, and critical thinking. Here's basically how the process works. Although Covering Hawkeye Sports might seem like a fun class to talk about sports, it is giving kids a chance to develop marketable skills like Photoshop and journalism but more importantly real-world life skills like leadership, empathy, and teamwork. I just wish this thing had been around when I was in high school. Check out CHS' Adobe Spark story that the team updates daily with its progress on the national championship game video. Google's CS First program has introduced countless numbers of learners to coding and computer science through Scratch. 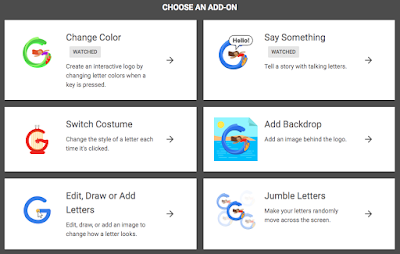 One of CS First's newest offerings is a module that teaches you and your students how to "Create Your Own Google Logo" like the Google Doodles that change daily on Google's search page. The module starts with a plain Google logo and then takes you through a number of ways to modify it and make it more interactive, just like the daily doodles do. All of the coding is done in the Scratch editor and if students have accounts, the projects can all be saved and modified later. According to Google, the project should take about 30-60 minutes. This is highly dependent upon the user's previous experience in Scratch though. The activities are a great way to use the CS First resources without committing to the full curriculum. The lessons seemed to be geared more for the elementary crowd but a number of ideas could easily be adapted for older students. Easy to lead discussion starters are a highlight that pose scenarios and ask learners what they would do. Topics include online bullying and taking personal responsibility for appropriate use of a technology. A fun culminating activity is the blank template for students to create their own Safer Internet Day poster. There are also additional classroom posters and resources you can print and keep up all year. Don't worry if you can't cram any of this stuff in today, the official Safer Internet Day. 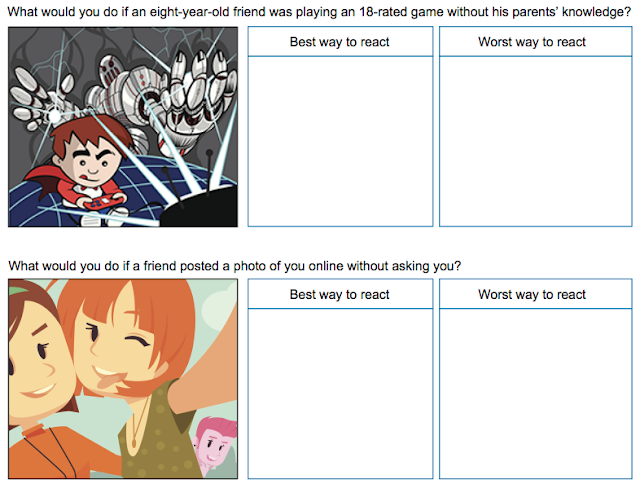 With these resources you can make everyday Safer Internet Day. Isn't that how it should be anyway? Update: A ton more great resources from Better Internet for Kids, the parent organization behind Safer Internet Day. 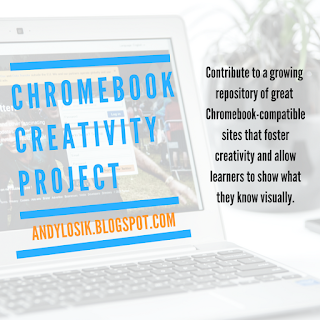 The Chromebook Creativity Project - Jump in. Since sharing some depressing data on how Chromebooks are being used by over 5,000,000 students in America's schools, great conversations have begun over what do we do about it. In my post I stated my dismay over the fact no creative sites were listed anywhere in the report. 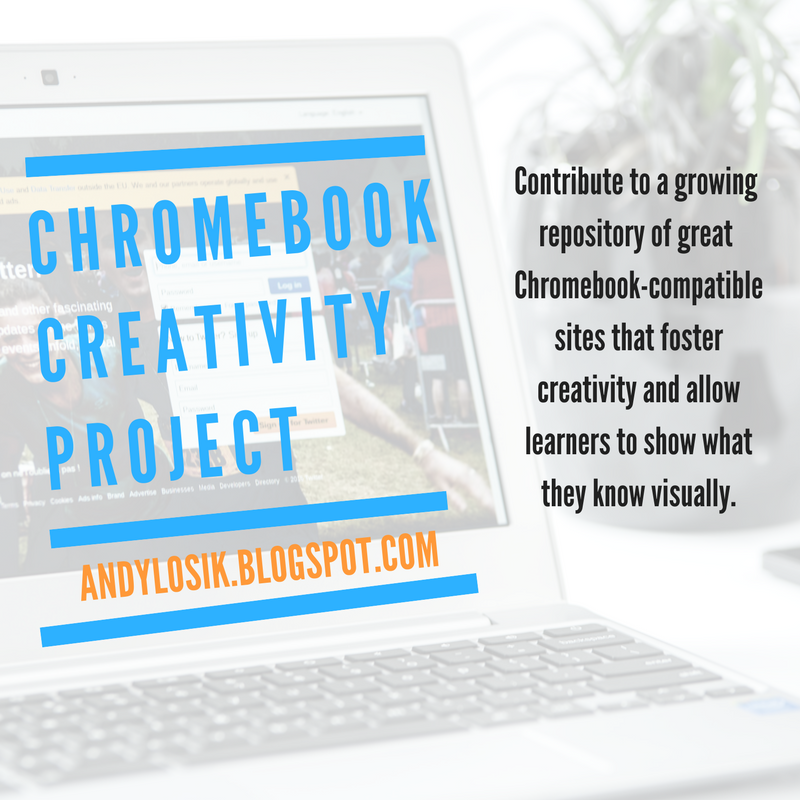 In order to help rectify this, I am beginning this page of links to sites that Chromebook-using learners can use to demonstrate learning in visual ways beyond the traditional typed document. All of these sites are free and with limited or no apps. Many require no accounts to use and ones that do require accounts often let users use an existing Google Account. Some do have premium features that can be added for a fee. This is very much an early work in progress and I will be constantly updating with new sites as well as lesson ideas. Please share additional sites that can be added to this list via this Google Form. The form also gives the option of sharing your own expertise on the app like grade appropriateness, lesson examples of integration, links to student work, and any other insight you would like to share. Book Creator App - This one does require some front-loaded setup but is a great tool for students to share learning. Book Creator Ambassador Kelly Croy shares some insight on this episode of this Wired Educator podcast. Photofunia - Small number of image effects may contain weapons of be of a PG nature. The NFL Players Association, EA Sports, and Discovery Education have teamed up to bring Madden Football to the classroom. These activities explore the math and science behind the game. 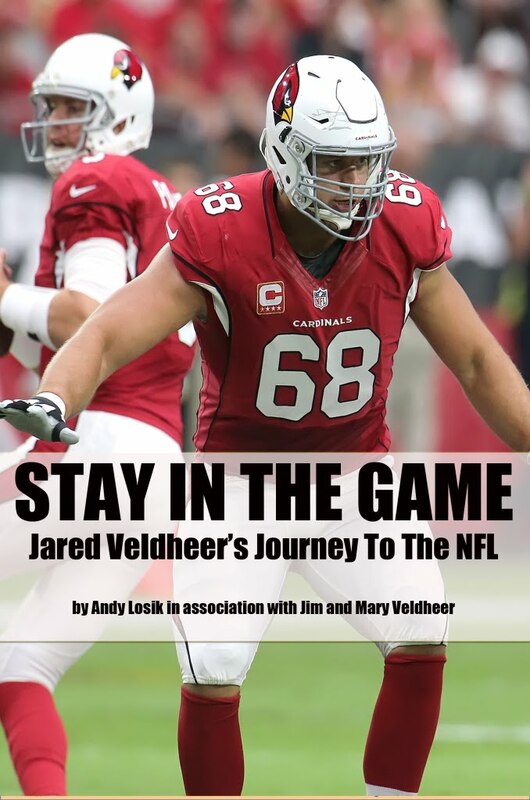 See how much you really know about football and play footballbythenumbers.discoveryeducation.com. How about taking your kids behind the scenes at EA Sports to see all of the "STEAM" that goes into making one of the most popular and successful video game franchises ever....and do it with Pro Bowl QB Kirk Cousins? Explore Discovery Education's virtual field trip to EA Sports and all of the accompanying educator resources.